Lee Abbott (John Krasinski) and his son Marcus (Noah Jupe) find themselves in close proximity to an alien creature with heightened hearing. Photo by Photo Credit: Jonny Cournoyer - © 2018 Paramount Pictures. All rights reserved. In what is one of the more impressive opening sequences to a horror film in quite some time, Krasinski sets the stage for our expectations of this world as well as the rules of such through what would otherwise be a forgettable trip to the local drug store. In this small, deserted town we are witness to a couple of children sifting quietly through the aisles while their mother attempts to locate a specific type of medicine in the prescriptions that have been left behind (a menial task made all the more tense by the sounds these small, but noisy bottles make). She is searching for something to give to her son, Marcus (Wonder's Noah Jupe), who needs to be brought back from the edge of what is seemingly a terrible sickness while her other children, the pre-teen Regan (Wonderstruck's Millicent Simmonds) and Beau (Cade Woodward) who is just clearing the finish line of toddler-hood, are the ones who tip-toe quietly through the store. Through these actions and this environment we come to a quick understanding of this world we're now existing within and that silence is, for one reason or another, of paramount importance. So much so that as Krasinski's Lee enters the store he is immediately frightened by the prospect of what could happen if the toy in his youngest sons hands went off as, for one reason or another, batteries were included with this toy. I mention the issue with the batteries because there are a handful of reasons as to why this abandoned rocket ship sitting in a store in an abandoned town might already have batteries in it, but it is also something that is easy to pick apart in regards to convenience and how the film doesn't always acknowledge aspects that would seemingly make sense for Lee and his family to follow. At one point, later in the film, Lee and Marcus take to the woods so that the father might teach his son how to fish and provide for his mother and siblings should something ever happen to him. During this excursion Lee enlightens his son to the fact that if he ever needs to let off a little steam or even just hear himself talk that the best way to do so is behind the coverage of an even louder sound that these invaders have apparently become accustomed to in nature i.e. a river or waterfall. If this is true, why doesn't Lee simply move his family closer to a waterfall you might ask? Well, other than the fact you aren't the only one that's likely thought of that and thus such areas have no doubt become populated and therefore ultimately a bigger risk for attracting attention there could be any number of reasons Lee chose not to do this. 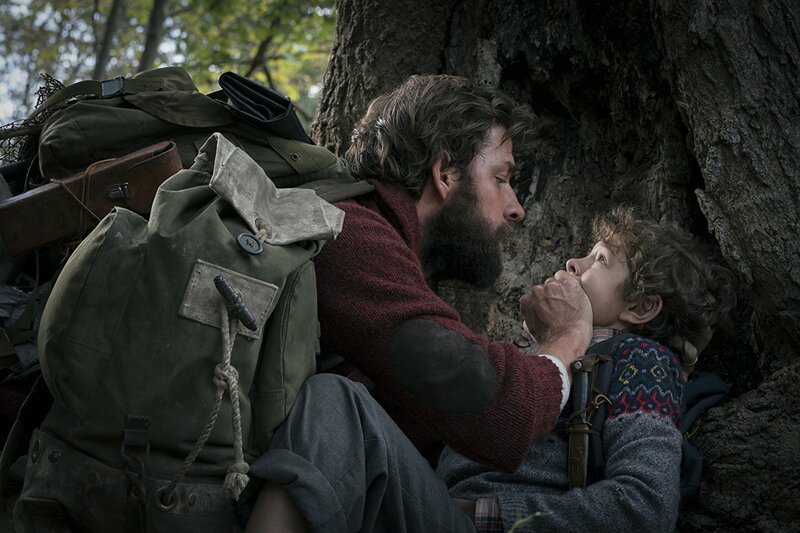 It's made clear Lee is a smart, big-picture guy who is doing all he can to protect his family and figure out the best steps moving forward, but A Quiet Place also keeps its story very contained leaving little room for outside influence or overly-long explanations and in turn opening it up for unnecessary scrutiny. 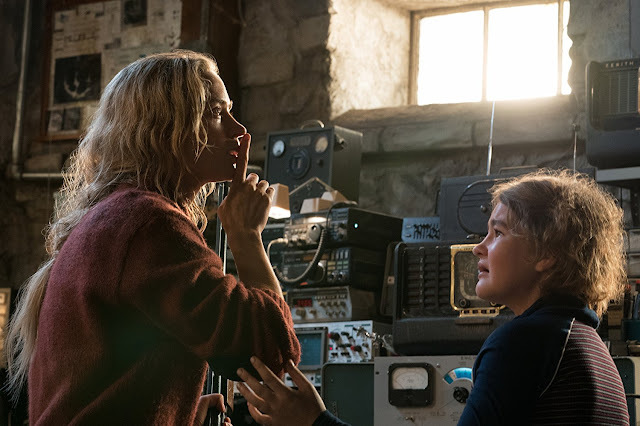 Taken simply on the terms in which it states, A Quiet Place is a masterclass in how to pull as much as one can out of what are a limited number of resources. The story is so contained that, outside of the opening and single scene in which Lee and Marcus go fishing, the film takes place completely in a single location. It is in this farm house that we're not sure if the Abbott family resided in prior to the alien invasion happening or not that Lee has rigged up lights to signal things are safe or not as well as countless booby traps, but most of his efforts seem to have gone into developing an underground bunker of sorts where eventually his family will be able to live something resembling normal lives and where he is able to continue his research of these creatures as well as try and make contact with fellow survivors. There are hints of other known communities and/or families surviving quietly around the Abbott's, but this isn't a story a la The Walking Dead and is instead solely focused on this single family's ever-evolving dynamic matched by their will to survive. The movie doesn't need to be about anything else though, and it doesn't need to be. In this, Krasinski shows his focus as a director who wants to explore how these people in particular react to and deal with these circumstances that are horrible and beyond their control. In this context we are witnessing the Abbott's still figuring out how to deal with this new-found scenario meaning they have in no way found a routine, but are still learning the best ways with which to deal with these antagonists. And from these situations and the necessity of the premise, this undeniable tension is born. There is rarely a moment throughout A Quiet Place that doesn't feel earned in terms of shock or scares as everything that occurs contributes to the overall sense of dread that deals in potentially slipping up and making the slightest sound that will trigger the sensitive ears (or whatever organ it is on these things that allows them to hear so well) of these creatures. And so, while the premise sets up these inherent moments in which tension, stress, and anxiety naturally bound forward it is how Krasinski executes these moments that really elevate A Quiet Place into something special. For instance, there is one scene in particular that-if you picked up on the context clues in any of the trailers-you will at the very least be suspecting and if you know what I'm referring to already trust that you are correct in your assumptions and know that it fully delivers on the horror of that scenario. It is in this sequence that the film achieves the most success with its visual storytelling and largely silent atmosphere by effectively using these tools to not only make you simultaneously want to look away while not being able to peel your eyes off the screen, but by delivering on this notion of how terrifying it is to be the sole barrier between the life and death of this human being that depends on you. Evelyn (Emily Blunt) and daughter Regan (Millicent Simmonds) may have figured out how to beat the alien invaders in A Quiet Place. The biggest challenge a film like A Quiet Place was always going to face though, was that of how does it continue to pursue it's fantastic and original premise throughout the full length of its runtime rather than simply devolving into something more generic? This was a chief concern of mine shortly after the screen went dark following that breathtaking opening sequence when the thought immediately became, "Well that was as great as it was horrifying, but where does it go from here? What more does it have to say?" That opening sequence is nothing less than a precisely executed and legitimately frightening short film, but given the small elements of the family dynamics set-up within the fact the film then jumps ahead from what is "Day 89" of this new life to day four hundred and something tells us that not only will adjustments and discoveries have been made, but also that the ramifications of that day will undoubtedly still be felt. It is in this throughline of this fractured family and the stakes that have been immediately set-up that both the concept and the emotional beats and themes are allowed to play out through the remainder of the film making it more than just a repeat of that opening for ninety-minutes, but something that evolves and has something to say. The screenplay from Bryan Woods and Scott Beck that received a revision once it hit Krasinski's desk is so tightly structured and translated into a picture that is so eloquently paced it makes the final act and acts of the characters that much more impactful and frankly, kind of beautiful. 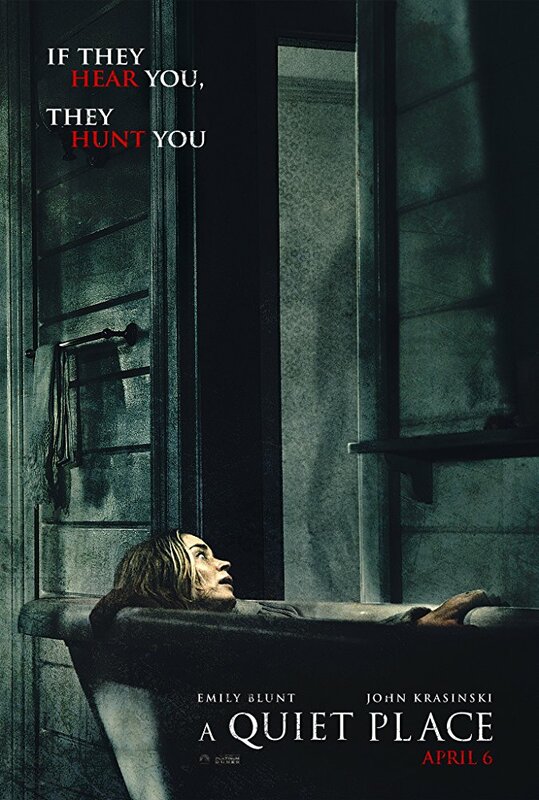 Again, this may be going back to the fact I took the movie to be about something explicitly applied to my life whereas others will see it purely as a great horror premise that is played for scares, but even with that perspective going in it would be hard to deny the emotional weight A Quiet Place ultimately carries. When a genre film such as this is able to transcend the boundaries of such it's always fascinating as it is something that is unexpected and expectations determine everything, but outside of A Quiet Place getting extra points for being able to make me feel something other than scared or terrified A Quiet Place feels like this great achievement because not only does it become what could be construed as a metaphor for being a parent or member of a family where that responsibility for another life is chosen or placed upon ones shoulders, but because it also does so much with so little in regards to the art form and does so in a successful manner. The fact this has become a mainstream hit and largely praised while featuring very little dialogue and minimal use of score and other sounds is enough to suggest the quality of technique at work and this is all without even mentioning the performances. Everyone is doing what the story requires from them, but Simmonds (who is actually deaf) and Blunt are especially in an element all their own. The expressions both are able to conjure and convey using only their facial features are remarkable and, if everything else about the film hasn't already driven home the combination of constant suspense and truly affecting ideas, their performances will.